Shorty's Sutures: A trip back in time...Chevy style! Yesterday we went to Dallas for a Hot Rods & Heels show. 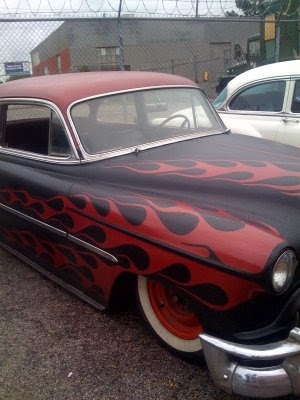 We were invited to accompany a good friend of Hubby's and ride along in a 1953 Chevy Bel Air with a local car club. As we pulled out of the parking lot where the car club's "shop" was I looked out the back window. I felt like I was in a movie! It was such a cool feeling to see a line of classic cars behind us all ready to make the trip to Dallas. We stayed in a line as we cruised along the highways, turning heads the entire time. The show was ok, but riding in this car, and hanging out along side of the other cars in the club, was amazing. Hubby and I have the restoration itch... again!